KPBSD had several teachers attend the ASTE Conference the last week of February (ASTE = Alaska Society for Technology in Education). On Monday of that week, Discovery Education had a social event to celebrate the group of dedicated educators in Alaska who use Discovery Education. Several KPBSD educators were honored for their distinguished involvement as DEN STAR members. Follow this link to read more about the event and see our educators “in the news”! KPBSD formed a partnership with Discovery Education in 2008 with the goal of providing a resource for teachers and students that would support engaging instruction in all content areas, but especially in social studies and science at the K-6 level. Over the past three years, teachers have been invited to participate in professional development that is focused at accelerating student achievement by bringing the world of Discovery into classrooms to ignite students’ natural curiosity. This year’s cohorts of teachers including: K-2nd grade, 3rd – 5th grade, 6th – 8th grade and 9th – 12th grade. The focus for next years professional development with Discovery Education will be to provide more Job Embedded opportunities for more schools and offer a Challenge Based Learning course for those teachers who participated in the 2011-12 cohorts. It’s exciting times for KPBSD with Discovery Education! 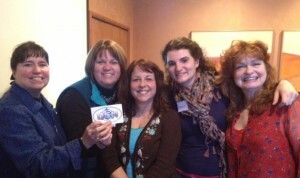 We just completed our third set of training sessions focused on strategies from the Write Tools seminar. The first seminar, held on 12/1/11 and 12/2/11 was so successful that we were able to bring it back just this week. When we opened up the registration for this weeks classes, registration was done within a 48 hour time period. Teachers were anxious to be included in this two-day writing professional development and many were left out because of the 40 maximum limit. Our Professional Development Instructional Coach, Michelle Thomason, has been kept busy going out to sites and providing inservices to small groups and whole staffs on the Write Tools. Interested in accessing support from Michelle? Contact her at mthomason@kpbsd.org. Educators who attended any of the three sessions are excited about the strategies they are using in their classrooms. Many are active contributors to the kpbsd.edmodo.com –> Write Tools online collaboration group. Interested? Contact Lori Manion for more information (lmanion@kpbsd.org). The iSafe curriculum was piloted in nine schools during the spring of 2011. Beginning in the fall of 2011, all certified teachers were required to participate in a minimum of 2 hours of inservice on important aspects of online safety. The material for this training was from the iLearn Online within the iSafe.org website. Users were required to create an account and log in. This gave them access to not only the professional development modules (in which there are 4+ hours worth) but also the curriculum to be shared with their students. All training was required to be completed by December 16th, 2011. Student education focusing on online safety was to have started by January 15th, 2012. All students, K-12 in the KPBSD will have received specific curriculum aligned to their grade level. Although we haven’t explored this in great detail, there is a section within iSafe.org that is geared to the parents. Parents are encouraged to create their own accounts using a personal email address. After logging in, parents have access to curriculum materials as well as training on specific online safety concerns. KPBSD has chosen to purchase the GOLD subscription. Therefore, educators/classroom teachers have access to a wide variety of materials, above and beyond the minimum outlined by the e-rate subscription. Educators, students and parents are encouraged to explore the iSafe.org further and become familiar with all the resources that are available to them. Let us know what you think about the KPBSD focusing on Online Safety for their students. Welcome to the KPBSD Professional Development Blog! If you have made it this far, than you are truly interested in learning more about how KPBSD provides professional development to its teachers. We are just beginning on this journey. Leave a note and let us know you visited. Designed by Lisa Sabin • E.Webscapes. WPMU Theme pack by WPMU-DEV.